‘Follow Me’ by Wael Mories. Some might sniff heresy in the concept of an “ecumenism of blood”, preferring instead to uphold the purity of doctrine and liturgical orthodoxy. But who quibbles over Chalcedon when you’re being rounded up and herded like cattle into trucks? Who cavils about the filioque while you’re being raped, tortured or sold into slavery? What kind of Christian bickers over the anathemas of Trent when you’re locked in a cage with other Christians waiting to being burned alive, beheaded on a beach, or, if you’re lucky, mercifully shot in the head? There are no divisions in the Church where there is massacre, murder, oppression and opposition to Christian testimony. Persecution dispenses with the particularities of Canon Law: it is a great leveller of petty doctrines and diminutive dogma. In the apocalyptic world of suffering and martyrdom, there are no Anglicans being sliced in half; no Nestorian Assyrians or Chaldean Catholics being kidnapped; no Copts being beheaded on a beach; no Roman Catholics, Salvation Army or Presbyterians being imprisoned or hanged for blasphemy. There are only brothers and sisters in Christ. By our baptism, we are united. Washed in His blood, we are made one. Shedding our own blood, we are the same; undivided and indivisible in our passion. The ecumenism of blood is the solidarity of submission and surrender to God and His kingdom. The suffering of martyrs is not unprecedented, but a history of agony does not diminish the present pain: Gethsemane is still followed Golgotha, and as disciples we are told to expect persecution and suffering. We are sent like sheep among wolves, and they tear at our throats, spill our blood and devour our lambs. In the darkness we are called to be a community of love. Like Israel’s prophets and her Messiah, we await the judgment of this world because it hates us because it hates Him. He suffered, and so must we. He carried His cross, and so we must take up ours. The ecumenism of blood is the fellowship of Christ’s sufferings. It is experienced by the apostles of the gospel, the martyrs of faith, the poor, the outcast, and the whole of creation that shares Christ’s tribulation. His sufferings are ours, and ours are His. ‘(I) now rejoice in my sufferings for you, and fill up that which is behind of the afflictions of Christ in my flesh for his body’s sake, which is the church‘ (Col 1:24). Our vocation is not only to suffer for Christ, but with Christ. 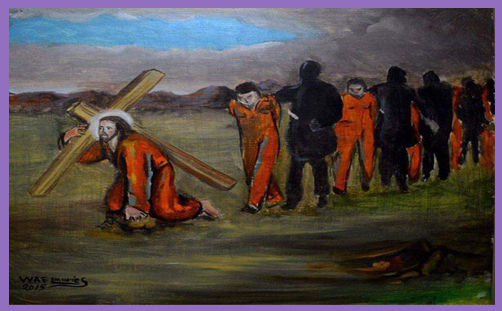 It wasn’t 21 Copts who were beheaded on that Libyan beach: it was 21 christs, for He Himself was present in their passion, and His passion indwelt their existence and participated in their suffering. We are at the apocalyptic horizon: this world is passing away and has no place for us. If we belong to Him and dwell in Him and He in us, we will be in agony until the End. But relief will come. And when that fifth seal is opened, we shall be together with the souls of them that were slain for the Word of God, and for the testimony which they held. And white robes will be given to every one of them, for they emptied themselves of themselves in conscious self-transcendence. In the mystery of the ecumenism of blood lies salvation.